Live, world wide earthquake data from the USGS. See information about significant earthquakes in history that happened on this day. Google Maps integration lets you see exactly where the epicenter was. Geolocation integration lets you see how far you are from the epicenter. Color coding of quake magnitudes lets you quickly spot big ones. 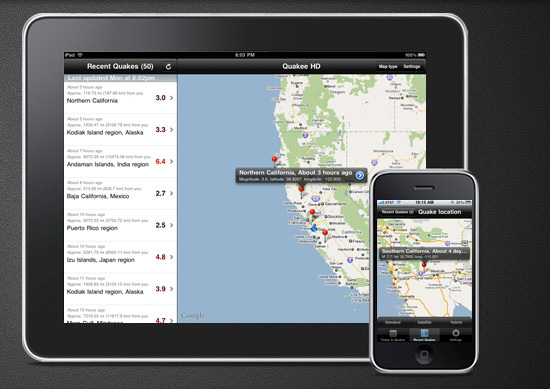 Easily access the USGS earthquake deatils page (currently only available in iPad version). Price: Basic version free on iPhone and Android, Pro version 99 cents on iPhone, HD version 99 cents on iPad. Find a bug? Want to request a feature? Let me know! Apologies for the app not updating for several days. The USGS retired the data feed the app was reading, they've been replaced and things should be fine now. Quakee is coming to the BlackBerry Playbook! Look for it in the App World market from day one. The Android version has been released! © 2011 Dan Giulvezan, All rights reserved.